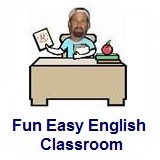 ﻿ Fun Easy English - new classroom free online classes english language lessons speaking listening writing reading february 22. 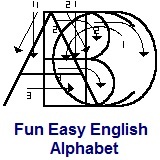 Today in the Fun Easy English classroom you are going to write the English alphabet letter C in manuscript and cursive. Writing the English alphabet letter C correctly in manuscript and cursive. Writing the letter C is very easy in both manuscript and cursive. In this lesson we meet Anna's co-workers at The Studio: Anna, Jonathan, Amelia, Kaveh, and Penelope. Rumors of budget cuts travel through the office. But who is going to get fired? Anna: Hum. Oh! “Important meeting. Everyone must come.” Well, back to work! And my boss has called a meeting. I wonder what it's about. Maybe we're all getting raises! Ooo, there's Jonathan! Maybe he knows. Professor Bot: Hi! I'm Professor Bot! This video is all about work. People talk about jobs and things that happen at work. Your assignment is to find as many work words as you can. Don't worry, I'll help. Anna: So, Jonathan, what do you think today's meeting is about? The email sounded important. Jonathan: Well, I have heard people in the building talking about budget cuts. Anna: Oh! Budget cuts? Wait, who has been talking about budget cuts? Jonathan: I know, but Mark knows everything that goes on at The Studio. Anna: That is true. But wait, look at us. We shouldn't gossip. That's how rumors start. We'll just go to the meeting and see what happens. Jonathan: You're right. No more talk about budget cuts. Amelia: Budget cuts? Oh no! Amelia: I just heard Anna and Jonathan talking about budget cuts. Kaveh: That must be what the meeting is about. When there are budget cuts, people lose their jobs. Amelia: Not you. You're a good reporter. Kaveh: And it's not you. You've done a great job as a videographer. Amelia: I can't go back to being a detective. Criminals scare me! Kaveh: And I can't go back to being a teacher! High school kids scare me! Professor Bot: Did you hear any work words? They talked about a lot of jobs. 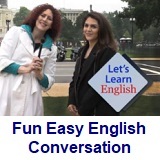 You can make the name of a job by adding an ending to a verb! Kaveh reports, so, he's a reporter. Amelia used to detect, so she was a detective. If you teach, you're a teacher. And a videographer….uh, I think you understand. Back to the story. Kaveh: Penelope, have you heard the news? Today's meeting is about budget cuts. Penelope: That's awful! What should I do? Kaveh: Update your résumé. I’ve already updated mine. I’ll see you at the meeting. Ms. Weaver: Hello everyone! Quiet, please. Quiet, please! Ms. Weaver: This meeting won’t take long. Then you can all leave. Ms. Weaver: What is wrong with everyone? You look like I'm going to fire you. Ha-ha-ha-ha-ha! Seriously, what is wrong with everyone? Anna: Excuse me, Ms. Weaver? Anna: Well, everyone has been worrying about, you know … We’ve been worrying that you are going to fire us! Ms. Weaver: I’m not going to fire any of you! No! The reason for this meeting is to tell you what a good job you’ve been doing and give out new assignments. Budget cuts have been happening. But only one person has lost their job -- Mark in Accounting? Now, let’s talk about those new assignments. Professor Bot: Ms. Weaver's team is doing a good job! How did you do? Did you find all of the work words? Here's a list you can check. calm - adj. not angry, upset, excited, etc.